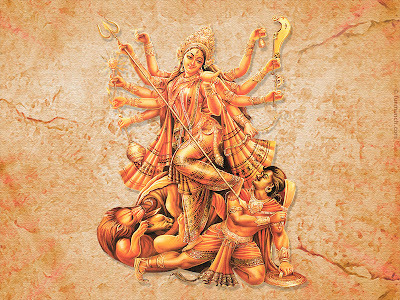 Stella's Musings: And Now, Goddess Durga To Kill Global Warming Demon!!! Move over UNFCCC and IPCC. Divine mother, Goddess Durga is here to take care of climate change! Starting tomorrow, India will celebrate one of its most colorful festivals – the Navrati(nine nights). During the 9-day period, the Bengali community all across the globe will also celebrate Durga Puja. According to Hindu myth, Durga or mother goddess will slay the demon king Mahishasura after fighting him for nine days and nine nights, thus ensuring the victory of good over evil. The idol of goddess Durga (see picture), is a depiction of this myth. But, this Navratri/durga puja goddess Durga will be fighting a brand new demon; he who has a real hot temper and who spews poisonous smoke. The name is Global Warming. Yes sireee!! Aha! What a befitting end for a warming demon! From Mirghat, move on to the Town Hall. There, you will see Goddess Durga releasing Ganga the river from the clutch of a demon called Tehri dam (that’s Mahishasur in disguise for you). Both the 'pandal's (makeshift shrine structures) will also have a tableaux, depicting several other small demons which are called terrorism, price rise, corruption and the vanishing lions in the wild! 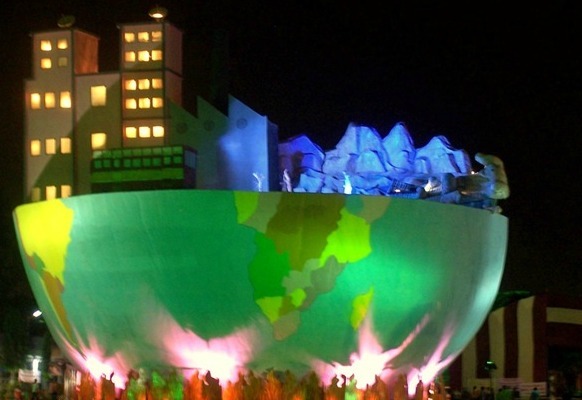 Now, if Varanasi can be this innovative, how can Kolkata – the real hub of Durga puja be far behind? Durga puja here is a huge show of creative thoughts and skills for the entire artist fraternity. So, coming week, besides other issues, you will see at least one puja site (Suruchi Sangha club), where the 'pandal' will resemble Kashmir. Here, goddess Durga will slay multiple devils - pollution, global warming, and melting of the glaciers. Be there, if you can! Bear witness to this most unique fight against climate change! @Gurudan: Your own blog (for Caribbean entrepreneurs) caught my eye too. I may not be your target reader, but will return to check for sure!